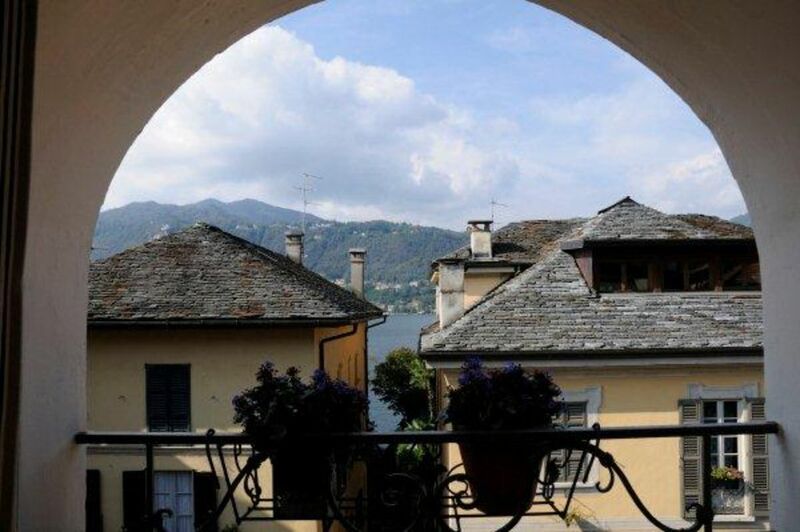 The perfect image of a cozy retreat away from home, our property is located in the characteristic center of Orta S. Giulio, where the eye is lost between the magnificent lake and the beauty of the internal streets. The building of the 1600s, while maintaining its original and ancient charm, has been recently restored and repainted, paying attention to all the details. The house is on two floors, with an attic and lake view. At the entrance you will find a beautiful outdoor veranda with stone arches where you can relax while enjoying a wonderful view. There are six beds, two double bedrooms and the possibility of using sofa beds. Two bathrooms with shower and bathtub. Ideal for families and couples of friends. Also available is the use of a private garage, 350 meters from the property. The house belongs to my family since the early 80's. I started going there as a child and used to spend my entire summer overthere. I have wonderful memories of that time. I'm 24 years old and live in New York, where I work as a freelance photographer and film producer. I've been living abroad for almost five years now, so my family and I decided to renovate this property and rent it out throught the year, so other people can enjoy our wonderful getaway. This excellent apartment is located in the oldest street in Orta San Giulio, and is a stone's throw from Orta's main square, the Piazza Motta. It's very central location and views of the lake and the island make it a perfect place to experience Italian life in Orta - shops ( including a small grocery store), restaurants and bars are a few paces from your front door. Giorgio was marvellous , helped us with parking on arrival ( having your own garage space is a real bonus) and made great suggestions for places to visit and eat. He was extremely helpful and charming - Thanks Giulio. The apartment is wonderful, 16th century, well equipped and well laid out and comfortable - it's romantic covered terrace really is an unexpected bonus. You are high above the streets below, with vistas over the rooftops to the lake and mountains. You feel as though you are participating in life outdoors, whilst in the privacy of your own terrace. Breakfast and evening drinks were a treat on the terrace. We'd love to return to Orta San Guilio and revisit this special apartment. Don't hesitate to book it. Stunning apartment with great views. Fully equipped kitchen, and the covered porch was amazing!! Great location, close to restaurants and shops. Donatella was great at welcoming us and showing the area. Two floors with two baths was great for our family, with 2 teenagers! We loved it! The apartment is large on 3 stories. The 2 bedrooms are spacious. The one way upstairs has a great view of the lake. Our 8 year old slept up there among the eaves. The small kitchen was more than adequate in a town full of great restaurants. We cooked a couple of dinners and enjoyed eating on the terrace sipping wine and admiring the lake. We swam every day in the lake -- going in just about 50 paces from the apartment. Donatella took care of any problems and gave us helpful advice. We stayed here for 6 nights after fast paced travel in 3 other countries. Orta was a great place to kick back and relax. The town is fascinating and the lake clear and beautiful. We would highly recommend Francesca's family's apartment, especially for families. We loved our trip to Orta and this was the best rental we had on our trip. It has plenty of room, lots of amenities, a great layout, all in a wonderful old building. Yes, as others say, the covered porch is the absolute highlight of the apartment. You'll want to sit out there all the time. Orta is charming and this place is close to everything. Note that it can be quite noisy at night. That was a bit of a surprise. You are so close that late night revelers' noise from neighboring restaurants - and some birds who stay up all night chirping - did make it a little hard to sleep. Small price to pay for all the other wonderful things, but it is notable. Donatella, who is facilitates the rental for the owner, is delightful and makes everything easy as can be. We used the garage which was so helpful. We are a family of four who used both bedrooms with queens and then a couch/bed in a small tv alcove that worked for our second son so everyone had their space. We miss Orta very much - it was truly a highlight of our European vacation. Wonderful apartment just a few steps away from the main town square. It was well equipped and had great bathroom with large showers. The kitchen was fully stocked with enough items to put together meals. The best thing was to partly enclosed balcony. We had all our meal outside under cover with a little view of the lake. The only problem we had was with the wi-fi. Very slow, perhaps it knew we need a break away from too much information. Great place and we hope to be back again someday. My family, including our four year old son, rented the apartment for a week in April 2015. The apartment, and Orta generally, is one the most charming places we've ever stayed while on holiday. The apartment is a large duplex with two well-furnished bedrooms along with two very clean, modern bathrooms. The highlight is absolutely the covered outdoor terrace with views of the lake and overlooking a small piazzetta. We ate every breakfast on the terrace and sat out most nights. The apartment is perfectly located, with a small shop right downstairs and a 2-minute walk to the main square. The private parking space is only 5 minutes away and invaluable given the limited parking. Booking with Francesca was effortless and she very understanding when we had to make an adjustment to our reservation. Check-in was flawless and Donatella, who greeted us on arrival, was very helpful. Overall, a wonderful experience in a beautiful apartment. Per prenotare e' necessario versare una caparra pari al 20% dell'importo totale. Inoltre e' necessario depositare 200 Euro come deposito per eventuali danni. Queste tariffe sono intese per 4 persone, per ospiti aggiuntivi e' necessario aggiungere 40 Euro per persona, per notte.